Everything can be labeled, categorized, sorted by topics, or given a tag. Cities can be big or small, movies can be funny or boring, people can be geeks or politicians…but how good are YOU at tagging the world? In TAGS, you have only 15 seconds to come up with at least one fitting answer. Withstand the time pressure, collect the most marbles, and become the winner of this quick and zany game for 2 to 4 players, which can also be played in teams with 4-12 players. 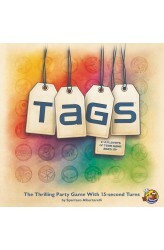 TAGS is an accessible and fast-paced guessing game based on the 1995 award-winning game Category by Spartaco Albertarelli. https://www.youtube.com/watch?v=ErgG3yrmams ..